Share this story: IT pros, we hope you’ll pass this guide on to your users to show them the Windows 10 ropes. Keep in mind that there have been four major updates to Windows 10 since its initial release in July 2015. 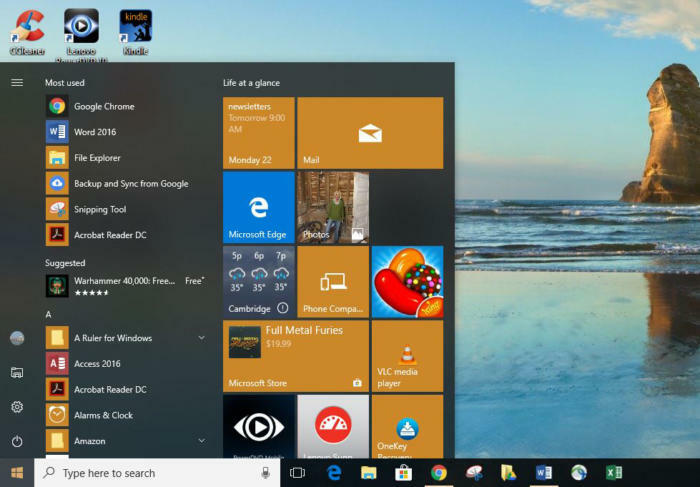 This story is based on the Windows 10 Fall Creators Update, released in October 2017, so the features that are described here and the screenshots you see may differ from what you see on-screen if you have an older version of Windows 10. File Explorer, Settings, Power: These icons at the bottom left of the Start menu are no mystery: File Explorer launches the file-browsing app once called Windows Explorer; Settings brings you to the Windows Settings app (more on that later); and Power lets you put your PC to sleep, shut it down or restart it. Click any icon to run it. 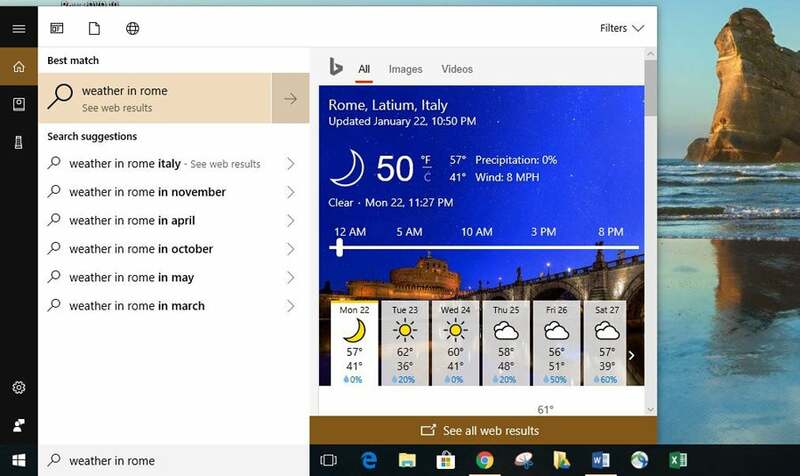 As shown in the video at the top of the page, the Start menu is highly customizable. To change its height, hover your cursor over its top edge until a two-headed arrow appears, then drag it up or down to expand or shrink it. 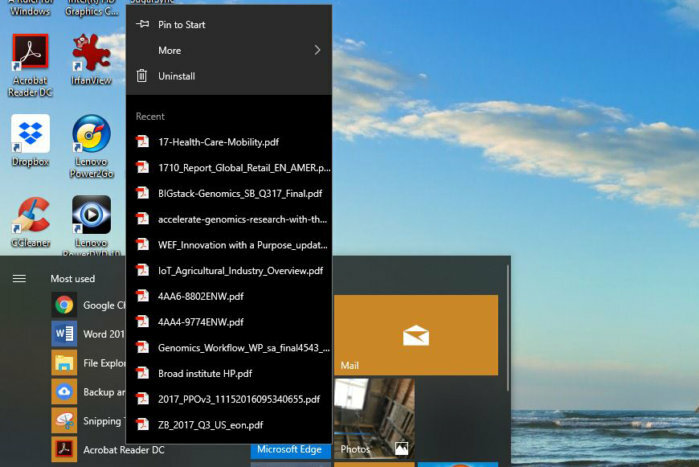 On some Windows 10 installations you can do the same thing at the right edge of the menu to expand it to the right or shrink it back again, although this doesn't work for everybody. The most basic thing you'll probably do is search. Cortana uses the Bing search engine to look through your files, your Microsoft OneDrive cloud storage, your videos and music, the apps on your PC, your settings, your email and the web. When you do a search, by default three icons appear at the top of the results: the leftmost one shows any app-related matches, the middle shows documents that match the search, and the one on the right shows web-related matches. When you do a search and click the web icon, you’ll then need to click a right-facing arrow next to the search in order to see the results, which will be displayed in a flyout panel that appears on the right side of the screen. The panel is essentially a mini-browser with the same information that you’d get if you did a search from inside your browser, including photos, links and so on. One thing about Cortana is a bit confusing. Even though it searches through many locations as I described previously, it doesn’t show all those results unless you tell it to. So, for example, it won’t show you the results of searching through photos on your PC unless you add a filter telling it to. To add filters, after you’ve done a search, click the Filters drop-down on the top right of the screen. You’ll see a long list of types of content, including emails, music, people, photos, videos and others. Click any content you want Cortana to display when you do searches. The next time you do a search, a new icon — for example, photos — will be added to the original three at the top of the screen. To see Cortana’s search results of photos on your PC, click the icon after you do a search. To make things even more confusing, sometimes Cortana shows results in a scrollable list just above the search box, categorized by content such as Documents, Folders, Photos and so on so that you don’t need to click a filter icon to see results. Other times it doesn’t do that, and above the search box instead it shows a list of suggested searches. In these cases, you only see results when you click a filter icon. There seems to be no rhyme or reason when Cortana does one or the other. I searched for “Italy,” for example, and saw a scrollable, categorized list, including thumbnails of photos and images on my PC. I searched for “Photos of Italy,” and the categorized list didn’t appear. So just be patient with Cortana, accept its shortcomings when doing searches, and use filters when you need them. Getting the most out of Cortana starts with learning how to control it better. 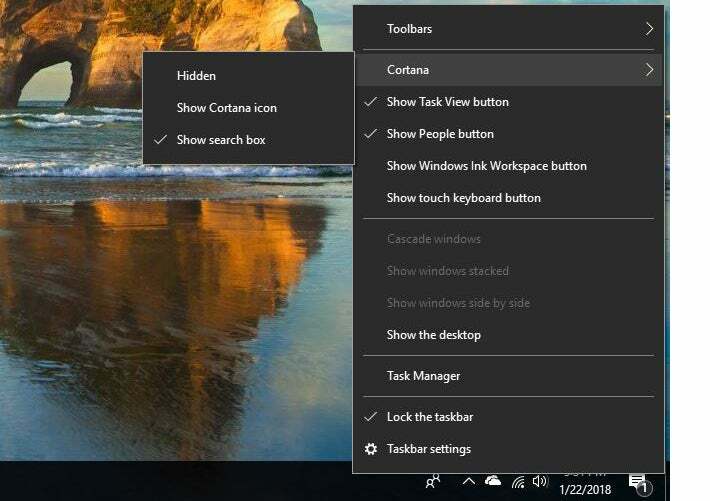 To do that, click in the search box and use the menu that appears on the left side of the screen, five icons that appear underneath the "hamburger" menu of three stacked horizontal lines. The five icons are divided into two sections, three at the top just underneath the hamburger menu, and at two the bottom, just above the Start button. The top icon, Home, navigates you to Cortana's main interface — what you see if you put your cursor in the search box. Beneath that is the Notebook icon. 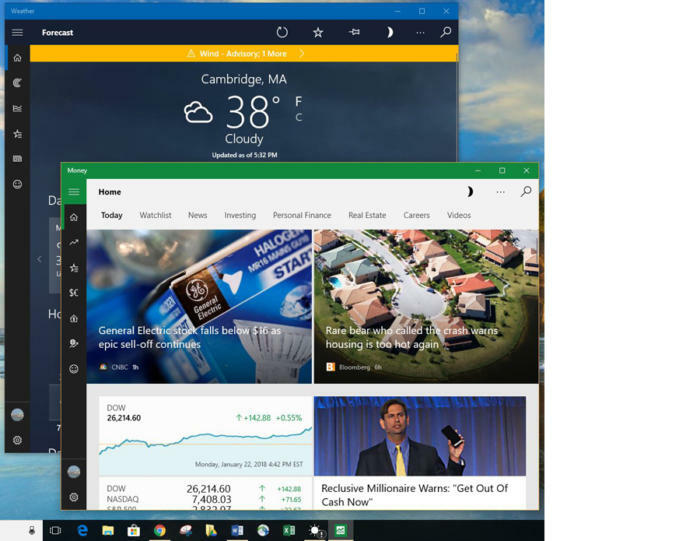 Here you can enter your home, work and other favorite locations; set preferences such as whether you want to get recommendations about places to eat or events to attend; change the name Cortana uses for you; and so on. The more information you enter, the more helpful Cortana becomes, because it knows more about you and your interests. Below the Notebook icon is one that looks like a speaker. If you have a speaker that incorporates Cortana, click here to set it up. Down toward the bottom of the screen is the Settings icon, which we used above to ensure that voice activation was turned on, and beneath that is a Feedback icon that lets you provide feedback about Cortana. The Windows 10 Fall Creators Update introduced a few new Cortana features, including using it to lock Windows, sign you out and shut down or turn off your PC. Say things such as, “Hey, Cortana, lock PC,” and it will do your bidding. You can also do all this from the lock screen, without having to log into Windows. And you can do more with Cortana from the lock screen as well, including making notes to yourself and creating reminders. The update also built more intelligence into Cortana. You can, for example, snap a picture of a poster for an event, and Cortana will detect the dates on it and ask if you want to create a reminder to attend it. There’s no documentation for this kind of thing, and behind the scenes Microsoft is continually making Cortana smarter. So your best bet is to experiment and see what new tricks it has up its sleeve. 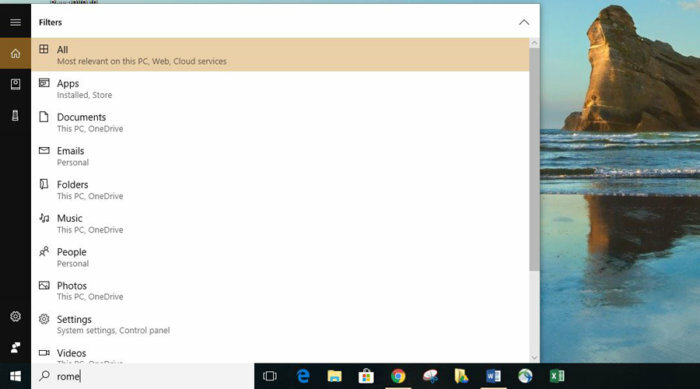 Windows apps also get a better way to access all of their features. On the left side or bottom of the app window you'll typically see a series of icons for the different features in the app. The icons change depending on the app. For example, the Weather app has icons for news, maps, historical weather in your location and so on. And the Money app has icons for markets, currencies, a mortgage calculator, and a watchlist where you can track specific stocks, funds or indexes. You can set up the Mail app not only to work with Microsoft's web-based mail service (currently called Outlook.com), but also with other web-based services, including Gmail. To add an account after you launch Mail, click Add Account, select the kind of mail account you want to add (Outlook.com, Google, Exchange, Yahoo, Outlook.com, POP and IMAP mail, and so on) and follow the prompts. For web-based accounts, it's straightforward. For POP and IMAP accounts, you'll need your account information ready, including POP and SMTP server names and passwords. You can also combine mail from multiple accounts into a single, unified inbox. To do it, click Accounts, and from the screen that appears, click “Link inboxes” and combine the accounts you’d like.